Friendships are like wildflowers, which I much prefer to the hothouse floral arrangements you can get from any store. Obliging fields surrender the most sincere offerings, complete with flaws and unique in beauty. This last month I have asked friends to give me 5 words. Any 5 words to challenge my imagination and discipline me to write in the time that beta readers are reviewing my book. I have a writing schedule, and I write at least three hours a day. With this challenge, the writing became public - in my blog. I loved this challenge! Not only did it let me create and play with words, it reminded me what incredible and unique friends I have. As you can tell, if you’ve read any stories, the friend who has given me the words is a huge part of the influence. My friends are beautiful, deep, have weathered many storms and are (for the most part) happy… despite the trials that life gives them. If you’ve missed any of the stories, I have linked them here to the friend who gave me the 5 words for inspiration. My next seven blogs are from my grandchildren (including my unborn granddaughter) and my daughter-in-law. After those, I pack up for South Africa to cheer Hennie Keyter on in Johannesburg as he launches his memoir “His Call, MyAll” (I helped him compile this and I am excited to be part of the launch) on the 23rd of February at Cornerstone Church. Thank you to all of my beautiful friends who are named here. Please shout if I have missed you and I’ll get your story done before I wave goodbye mid-February. · Elmay Oberholzer, a beautiful friend from Johannesburg was the first. She is a girl who has a spirit that desires to see the whole world – and she is lovely! Her words: "...as I stepped onboard I..." inspired “ghosts” – a story of a girl who is haunted by loss and abandonment. · Frank Stephens is a super-literate friend of mine who is politically astute and a world-class apologist. I look up to him spiritually. His amusing words: “bald, glasses, turbulent, muffins, dog” inspired the work “turbulent” – a story of a man who has a fear of flying. · Michael Roome, a boy I once knew is now a man who will one day be a United Nations delegate. He is sharp and wonderfully humble…. His words: “She glanced in horror as...” inspired “horror” – a tale of two vegan individualists having a fight about a conventional sweater that makes its way into their world. · Kelly Simon Cooper is a new friend from Sacramento. A fellow writer and teacher, she is nearly finished with a masters program (yea!) and still finds time to read my stories!! “Verdant, Astronomy, gargling, wicked, infrastructure, and her super-challenge “ cornobbled” inspired “fisherman” – a tale of a learned man who takes a job on an ocean trawler to prove he can be a man among men. · Lisa Haynes, a beautiful mother of two, is a South African rose transplanted into the harsh wildlands of Redding, California. Her words: "this time, it was different" inspired “topoisomerase” – a story of a young couple whose lives change once they discover their daughter has autism. · Marc Peffer is one of our longest-heart-held friendships. His brotherhood has been a gift from God and we are joined closely with his family forever. His words were “ By grace we are healed” and inspired “unjani” – a story set in a South African township. A man, who loses his eight year old son, struggles with his faith and marriage in the aftermath. · Sue Conner, a fellow teacher who worked alongside of me in the Christian school I once worked, gave me the words “She dared to open the ....” which inspired “letter” – a tale of how the seed of gossip is sown in a small town, only to destroy the peace of a family unnecessarily. · Connie Eaton Rogers, a spiritual mentor of mine, lives in Tempe Arizona now. She is a delight to me and loves justice! She gave me “ fractured, sanctified, Valedictorian, frenetic, sovereign” which inspired a story so complicated that I could not dilute its title down to one word: “Jin Campaigns Against the SongDynasty” – a teenage girl’s account of the ongoing war between her parents and the way it’s affected her life. · Vince Rodriguez, my beloved son, gave me the words “Vikings, samurai, space travel, bacon” I cried while writing this story: “vikings” – a mother’s perspective on her adult son and how he has become a man every bit as wild as she saw him being as a boy. · Debra Ann Young, a delightful friend and animal activist from New York City gave me the words “children, restaurant, beach, love, bankrupt” and it fell on Martin Luther King Jr’s birthday! Such perfect words to punctuate “martin”, a tribute to this great man. · Susan Purdy, a beautiful friend who is also a new mother gave me “garden, community, secret, violence, healing” – perfect words for her, a true community activist who champions gardens that are shared in neighborhoods! The story “garden” is one of hope: Vietnamese immigrants change a patch of derelict land into a true blessing for their community that brings the whole neighborhood together. · Christine Crom McGuire, one of the prettiest girls I have ever seen up-close, gave me the words: “Blessing, love, extraordinary, grateful, heartbroken” and inspired the story “agnes” an historical account of a Catholic girl who lived her faith out loud. · Lynette Devenish, one of my beautiful, faith-filled friends, gave me the words: “pumpkin, unchanging, waves, clouds, storms” to inspire the story “restoration” – a tale of an art restorer that needs restoration herself - from God! The story meant a lot to me, as it came during a time we were in heavy prayer for Garth, Lynette’s husband, who has cancer. · RobandBridget Forbes, a couple of immense value in our hearts gave me the words: “Cheese, vw beetle, favourite, wine, ger” to inspire heroes. This story is a reflection of who the Forbes are to us – having lived in Mongolia for fifteen years – and also championing the beauty and wildness of the ger (the Mongoliam round house) and Genghis – a hero to all Mongolians. · Mike Rivera, a genius and brother in the faith, gave me “Searches, Finds, Loves, Loses, Reunited” the day that my beloved Uncle Walt died. In his honor I wrote “Uncle Walt” and cried as I did. · Lara Ashley Fowler, a beautiful girl and former student gave me: “ Ballroom, pink, sock, princess, and SHANK! !” Honestly, Lara!! I wrote a story about the random pop-ups in family: wife. This takes place at a funeral when the unwelcome wife of an estranged brother shows up. · Bridget Shank, another one of my mentors and a very special woman gave me: “Change, contemplation, choice, intimidating, spring” inspired “change” – a story of a young lady and her niece at the park who have a chance encounter with an old lady that influences their lives. · Danny Lake, a former football coach and all-around man of God gave me the words: “Danny, manly, awesome,wonderful, available” then quickly added hahaha. I actually warned him: “Obviously, you have never read my short stories, Danny Lake! You may regret you gave me those 5 words. ...” He didn’t. It gave me “manly" a story of a rough and ready biker who meets a man who lives by his word, on generosity and for his family. · Francois Marais, our beloved personal trainer and incredible seeker of truth, gave me “Calamity, reprobate, Tukuman, Iscariot and schitzo” to inspire the frenetic “horror” – a story of schizophrenia from the perspective of a schizophrenic. I found this to inspire a great deal of prayer for friends with this disease. · Rick Martinez, our most beloved pastor and Spiritual leader also likes the way I write. For this reason, I wrote and re-wrote and re-wrote “zeke” – the most popular story of this series (according to hits). Rick’s words were: “ I don't believe in God anymore,” inspiring this story of a homeless skateboarder who has been let down by his family and the church. · Caroline Passier, a true friend who loves Israel and will take us all one day (!) gave me the words “love, in love, and romance” – inspiring the very Jewish “shiva” a story of the traditional grieving period after a loved one dies in the Jewish community. I absolutely loved this story. It told itself, unfolding with a story of a young couple whose happiness is cut short by an unexpected death. · Amanda Lai, a very cool girl who has become a woman right before my eyes, invited me to craft a story for her daughter, who LOVES princesses. “Princess, Love, Beauty, Giving, and Heart” inspired “emeralds” – a tale of a magic kingdom of acceptance told for all ages. · Tim Silva, one of the very first boys I ever had a crush on, gave me “Excitement, Paranormal, Scary, Beautiful, and Spiritual” – for me to tell first person narrative “paraexistence” from the perspective of a young girl trapped in a small town with a ghost story. · Alicia Robynn Vosburg, my beloved beautiful daughter gave me the words: “Mother, daughter, flute, eggroll, fight” and I surrendered “tigerdragon” – a tale told from a mother’s perspective about her relationship with her adult daughter. I wept as I wrote, and reminded myself it was all pretend.. all fiction. How much she means to me! · Debbie Haines, a doctor who accompanied us on our trip to the Sudan, became one of my very best friends who understood the deep, deep parts of my heart. Her words: “ father, necklace, solace, refugee, Narus (the town in Sudan)” inspired “protoplasm” – a story of the great dysentery plague during the Sudanese civil wars of the 1990’s. The terrible nature of war gives the most hideous images, but also yields the most hope for survival and humanity. · Jan Ahlfs is a friend I haven’t seen in awhile, but can connect with like no time has past when I do! Her words: “Sky, tunnel, blue, grace, friend” All wove a story of a friend’s desire for vengeance and the true power of redemptive "grace". · Callie Tayler, my dear Snow White friend, is one of the best people I have ever travelled with in my whole life. Her testimony of God in her life is amazing (corner her and get it!) Her words: “On a dark, stormy night…” created a story within a story: absence. When parents have adult children, you are not supposed to interfere with their lives, but you can’t help overprotecting them...even when you’re not invited! · Tiff Debrichy gave me a very pensive “love and intimacy” to inspire the story “shopping” – a complicated story of prejudice, racism, ageism and the changing landscape of culture. Like Tiff, it is a story with many nooks and crannies... not easily told. I have a friend name Judith Stone Moos, a wild-card that gave me these words: “floral, wave, create, imagination, play” – which helped me compile this blog – five. 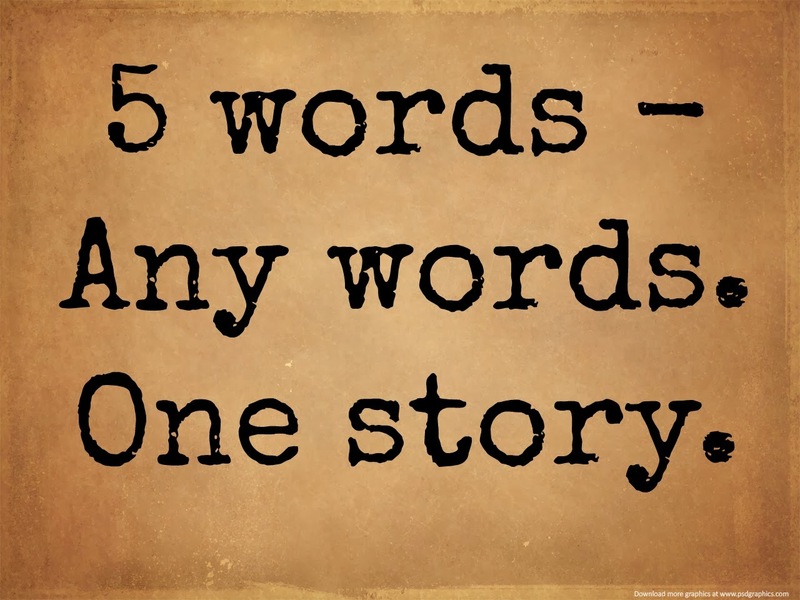 Give me five words and I will be so so so so happy to weave it into a story – inspired by you! Please stay tuned for my family stories. They will be consecutive for the next week.